What made "I Love Lucy" so funny was the excellent and hysterical written material that the actors followed. However, these scripts called for more physical attributes than verbal. For instance, Lucy doesn't just shed a tear and weep - she wails and stretches her mouth muscles wider than a crying infant. Another admirable concept was that all of the props were real and effective. For instance, a large, long loaf of bread was used, and real large tunas were used to create an effect. In this episode, Ricky and Fred get into the 'chicken business' but they aren't laying any eggs. Trying to settle arguments, Lucy and Ethel buy dozens of eggs. When Ricky gets home, the girls try to hide them - Lucy puts them in her blouse. Ricky reminds Lucy that they should rehearse their tango dance for the PTA event at little Ricky's school. When the big finale comes for Lucy to land in Ricky's arms, the eggs crush and Lucy is left with a big mess in her blouse! PROP The effect of using real eggs was great. Not only did it add excitement to the plot and the audience, but it also encouraged many outrageous expressions from Lucy, as well. FACT This scene when Lucy and Ricky do the tango received the longest recorded laugh in the show's history! In this episode, Lucy and company finally arrive in Los Angeles! At the Brown Derby, Lucy accidentally causes a pie to fly in William Holden's face. When Ricky unexpectedly brings Holden home later that day to meet Lucy, she tries to avoid embarrassment by disguising herself with a clay nose. After lighting a cigarette, her nose catches fire, and she quickly blows it out. PROP A wick was placed within the clay nose to prevent Lucy's actual nose from catching fire. 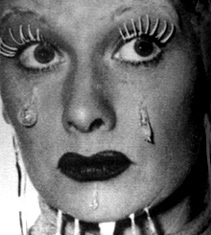 Lucille Ball improvised dipping her flamed clay nose in a cup of coffee. In this episode, another battle of the sexes occurs and each side (Ricky & Fred, and Lucy & Ethel) must survive on pioneer-living conditions. Whoever does not administer the most effective way of living as in the 'pioneer days', loses the bet, and the money! Ricky takes an old fashioned bath and travels home on a horse, and the girls dress in old fashioned clothes and Lucy attempts to bake bread the hard way. 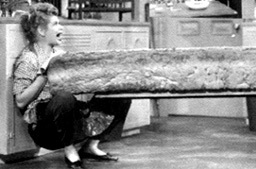 However, Lucy uses too much yeast, and to her dismay, the bread turns out to be a lot larger than she expected. PROP The bread coming out of the oven (from the side of the set) was an actual loaf which was custom ordered and baked by a willing bakery for the special uses of the studio! Yes, the loaf of bread was actually that long. home-freezer without Fred or Ricky's permission. They stock up on hundreds of dollars worth of meat and have no place to hide it except the freezer in the basement, where Fred and Ricky find reasons to go. When the boys come home, Lucy goes down to the freezer to keep patrol, and she gets locked in! When Ethel finally remembers where Lucy has been, they all go down to see her, and find her frozen! PROP A marvelous effect was produced by using make-up and solutions that looked like ice. Take a look at the close-up photo to the left. In a competition to see who could catch a bigger fish, Lucy & Ethel buy a big tuna fish for back-up. What they do not know is that Ricky and Fred have done the same thing! Time goes by as both pairs try to hide their fish in each other's hotel room (in Florida), until they bump into each other and discover their own schemes. 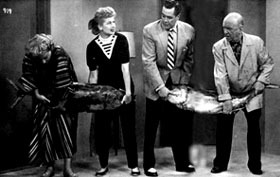 PROP In this episode, real, large tunas were used to create the slimy and stinky effect. The director commented that these real fish were able to bring out even more realistic expressions from the cast members. The fishes were ordered and paid for especially for the show, and the final effect was fabulous.